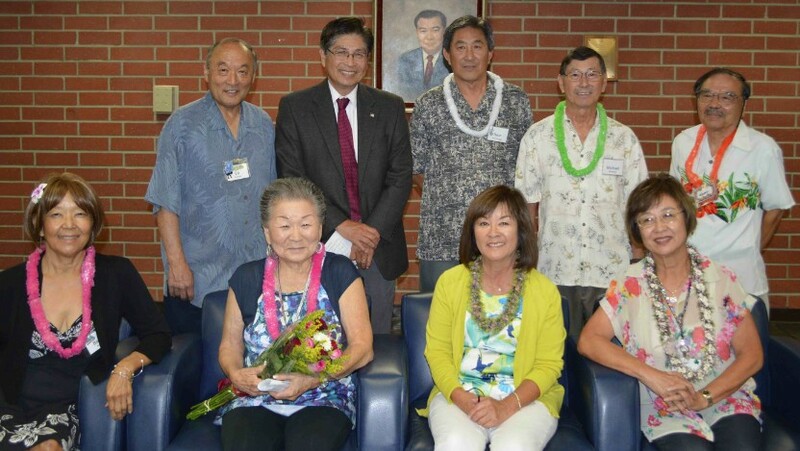 The Nikkei Socials held their 47th annual installation at the Hawaii Night Social/Dance on Sept. 3 at the Nakaoka Center in Gardena, with a lively crowd in attendance. Terry Terauchi, councilmember and former mayor of Gardena, did the official installation of officers. Pictured after the ceremonies are the newly installed officers. Front row: Barbara Komatsu, membership chair; Shiz Nakasone, president/treasurer; Lynn Isomoto, secretary/newsletter editor; Janis Fukumoto, secretary, recording. Back row: Ed Kambe, program/social chair/publisher; Councilmember Terauchi; Dean Mochinaga, auditor; Michael Imahara, beverages; Gerry Kado, inventory/logistics. Not pictured: Joyce Okazaki, public relations. For each event, refreshment coordinators Janis Fukumoto and Lynn Isomoto plan a special snack treat for intermission. In addition, the Music Committee and program chair plan the music to be played at each dance with attention to a variety of dances from ballroom to mixers to line dances. The next social will be on Oct. 1.